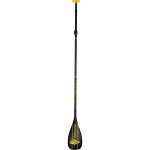 The Lakeshore Paddle Company River Rover is the ultimate expedition SUP. This board is designed to carry a lot of weight and has numerous tie-downs for all your gear. Effortless glide, excellent tracking, and extreme stability & buoyancy makes this board the premiere watercraft for exploration and discovery. 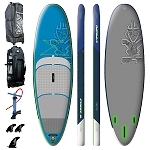 Whether it be fishing, camping, snorkeling, diving, exploring, or touring – this is the board for your next adventure. Canoe like front displacement hull for “true” flat-water paddling. Front tie-downs with bungee system. 2-way maintenance free air vent for continuous pressure stabilization.